What Does a Tiger Eat? 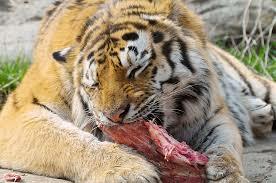 A Tiger probably eats a ton of meat. I try to eat a lot more meat these days too. My daily intake is a couple of hard boiled eggs in the morning. I get to work and have a fruit plate which usually contains pineapple, cantaloupe, watermelon and papaya. Lunch is a spinach salad with sliced cucumber, tomato, and pieces of chicken breast I prep on Sunday. Dinner is whatever my maids make for a vegetable side and mutton I prep on sunday. I don’t mind the same meal every day because on the weekends I give myself some variety. For prep I buy 6 chicken breasts which I marinate in Italian dressing and fry in coconut oil. I cut it up and put in a bowl to distribute in my salads through the week. So far that seems enough. The mutton I get 1kg of mutton cubes which is two legs worth. I cook that with spices, usually a mutton masala. I add stew vegetables to go along with it. So Carrots and okra and if in season mushrooms. I buy bags of spinach (sadly not baby spinach) and assorted vegetables. My maids cook up a variety of vegetable dishes through the week with whatever I buy. They use my coconut oil for cooking or ghee so it is all paleo friendly. Right now I am still cheating a little with a samosa here and there or a croissant but as I am going along I am finding them not to be as much of a treat any more and feel bad after eating them so I will soon remove them from the diet all together. 80/20 is still my goal for this diet and enjoyment. Another cheat I am working out of my diet are liquid calories. I have a rose shake and a chai everyday. While not the worst cutting them out entirely and just having water will be best.